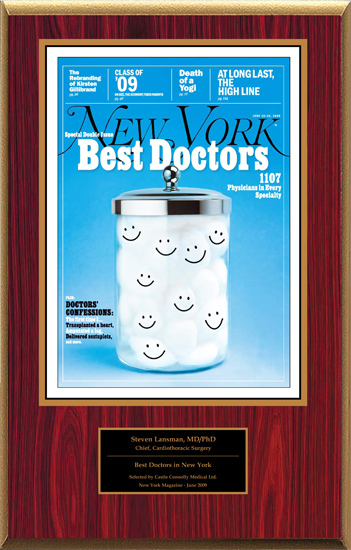 VALHALLA, New York – June 7, 2009 – Steven Lansman MD/PhD of the New York Cardiothoracic Group has been named to New York Magazine's 2009 list of Best Doctors. This list profiles 1,107 of the best doctors in the New York, Connecticut and New Jersey areas. New York Magazine gets its list from Castle Connolly, a New York City research and information firm. The list is a shortened version of the annual guidebook published by Castle Connolly titled Top Doctors: New York Metro Area. The guidebook lists the top 10 percent of the region's physicians and profiles more than 6,000 in all. Physicians are chosen through a peer-review process and the firm investigates each doctor's credentials and disciplinary history. The list is also balanced based on specialty and geographic location. Currently, Dr. Lansman is Chief of Cardiothoracic Surgery at the Westchester Medical Center and a Professor of Surgery at New York Medical College. Specialties include Coronary Artery Surgery, Ventricular Assist Device (LVAD), Heart Transplant, Aortic Aneurysm and Heart Valve Surgery. Dr. Lansman has over twenty five years experience in the field of Thoracic Surgery and is honored, for the fourth consecutive year, to be recognized by his peers as one of New York's best heart surgeons. The New York Cardiothoracic Group (NYCTG) – Dr. Steven Lansman, Dr. David Spielvogel, Dr. Ramin Malekan, and Dr. Paul Saunders – is located at Westchester Medical Center. Founded by Drs. Lansman and Spielvogel in 2005, the group specializes in cardiothoracic surgery and is dedicated to providing cutting-edge surgical treatment for a wide range of cardiac and thoracic conditions. From coronary bypass grafting (CABG) and minimally invasive mitral valve repairs to heart transplant surgery and repair of complex thoracic aortic aneurysms, the heart surgeons at NYCTG rely on their extensive experience to deliver outstanding results. To learn more, visit www.NYTCG.com or call (914) 493-8793.